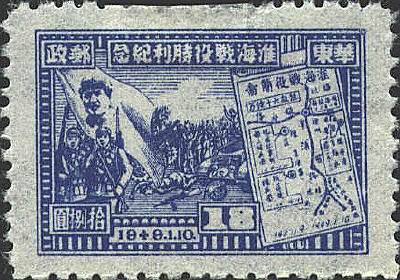 The two stamps were issued by the East China Liberation Area at the end of the conquest of the mainland. The first shows Mao and a map, and marks the victory of Hwai-ying and Haichow. 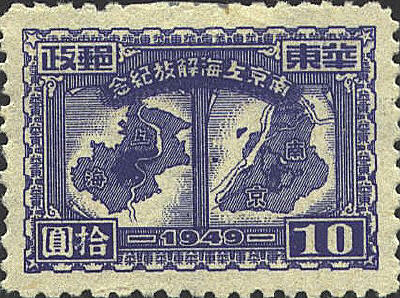 The second marks the liberation of Shanghai and Nanking whose maps appear on the stamp. 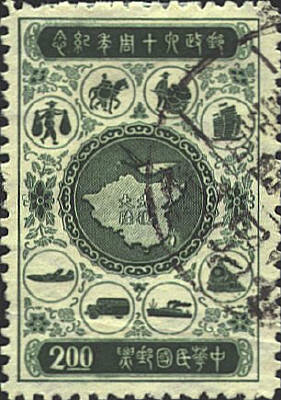 The stamp shows a map of China and modes of transportation. It was issued by the Republic of China (Taiwan) to commemorate the 60th anniversary of the founding of the modern Chinese postal system. 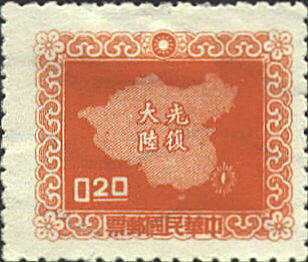 The stamp was issued by the Republic of China in 1957. The legend on the map says, "Recovery of the Mainland." A second issue was released also in 1957. The obvious difference is the dark blue border.